St. Francis N.S. has a great tradition in green schools and is proud to say that they are one of the few schools in the country who have already achieved four green flags. 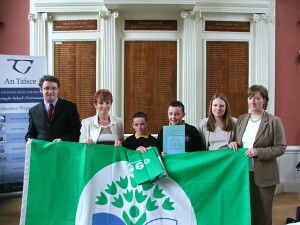 The green schools flags achived so far include Litter and Waste, Energy, Water, and Travel. This year the school will be hoping to achive their fifth green school flag which based around the theme of biodiversity. In 2011/2012 – St. Francis N.S. achieved the green school flag for transport. This flag was achieved with great work from the Green Schools committee lead by Mrs. Bourke. On May 22nd, Mrs.Kenny & Mrs.Bourke together with two students went to the Sheraton Hotel in Athlone to receive our 4th Green Flag. 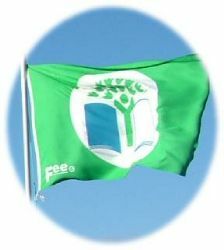 The official raising of this flag took place on the 18th June 2012 when Éanna Ní Lámhna was invited as special guest to the school to raise the green flag. I was really excited when I first heard about the green schools slogan and mascot competition. At first I just wanted to make a slogan but then I started thinking about Zero Hero aka Cow Man. I told Ms. Kenny about my idea and she asked me to draw a diagram. The next day I brought the diagram into her room and showed her, she said to go to Ms. McCann because she is a good artist and has done stuff like this before. She said we should gather all the materials to make him, after that we started to make him with toilet paper tubes for the body, wires for his hands and feet and paper mache to cover it and paint . We used a coffee cup for his head and paper mached it and painted as well. The journey for finding a name and slogan was a bit different because I went from class to class asking for them. I thought of cow man as the name and “cycling is fun so give it a go you will build up your muscles and save lots of dough” as the slogan . Ms. Kennytook pictures and sent it off and all wecould was wait . About two to three weeks later Ms. Kenny called me up at assembly and told me I won a prize and was going to go to An Taisce in Dublin. The day of the An Taisce thing my mother got me up so we could get ready. We got the train from clara up to Dublin and then we went on the Luas to the four courts and then we walked from there to the an Taisce building. We arrived there at about ten o’clock and we were greeted by An. Taisce workers who registered us and then we went down for some coffee, cookies and a smoothie which was really nice. Then we went tup to the presentation room where pictures of my mascot were on display along with a podium on which we put Cowman. They also presented Ms Kenny with a cheque for the school and a digital camcorder.Then we had more photos taken with the minister and the bikes.It was then time for lunch and we all went down to the dining room for a buffet lunch which was delicious and I was very hungry . Then we went back outside and picked out the bike we wanted. I picked a black BMX.